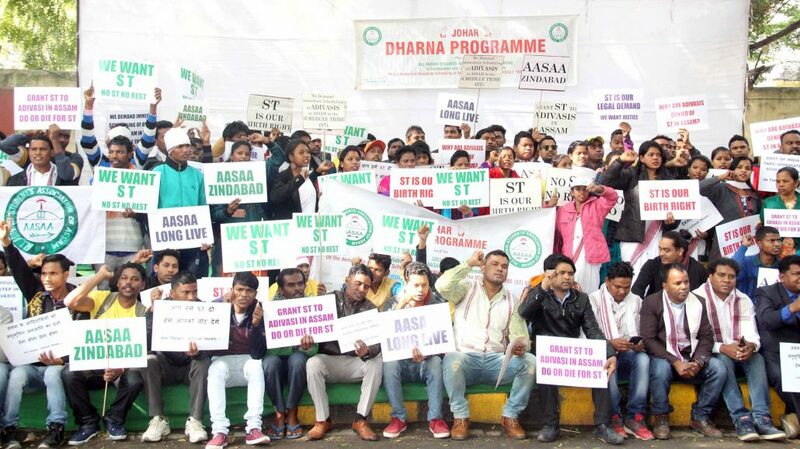 The All Adivasi Students Association of Assam (AASAA) on Friday staged a protest demonstration at Jantar Mantar demanding early recognition of Scheduled Tribe (ST) status to the Adivasi people living in the state. “Their right is legitimate. If Adivasis living in other states of the country can get the ST status, why not to those who are living in Assam,” said Lok Sabha MP Naba Kumar Sarania. Sarania said that he will raise the issue in the ongoing session of the Parliament. Interestingly, the centre has already setup a Group of Ministers (GoM) in Assam to look into the issue of giving ST tag to the six communities of the state. “The Adivasi people living in Assam have been demanding ST status for a long time. The Congress government had earlier initiated the move. And now when the present government has further taken the issue ahead, I hope the Adivasis will get ST. At the same time, we cannot really rely on the BJP government,” said Santiuse Kujur, a Congress MP in the Rajya Sabha.